A very important part of AIDSWALK each year is the Quilts Opening Ceremony. 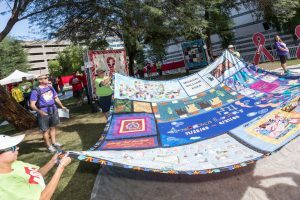 Quilt panels from the Tucson AIDS Quilt and the National Names Project Foundation will be on display, this is a must-see part of the event. If you have any questions, please contact Fred Rodriguez, Events Manager, at (520) 547-6107 or frodriguez@saaf.org.